Here's a great, comfortable ADIDAS 1/4 Zip pullover jacket in crimson 100% lightweight polyester. 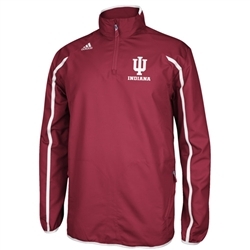 Accented with a woven applique IU logo with embroidered 'INDIANA' underneath along with 'INDIANA' embroidered on the back left shoulder. There is a reflective zipper taping along with mesh lining. The Climaproof Adidas technology is perfect for those windy days. 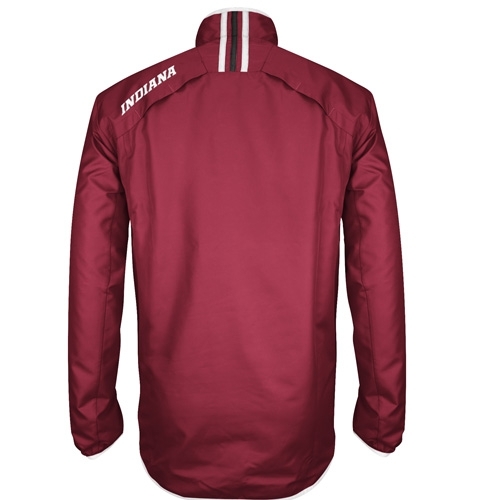 There is a nice three stripe detailing on the back neck and white accents throughout. A side seam zipper makes this a great fitting garment. Men's sizing. Copyright 2008 www.HoosierTeamStore.com. All Rights Reserved.